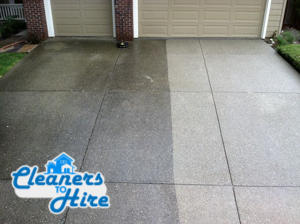 The driveway cleaning is one of those labour intensive and time consuming sanitation jobs which require a certain amount of knowledge and preparation. Fortunately for you, we are here to lend you a hand and help you with your upcoming cleaning project. We are professional and seasoned sanitation technicians and we have the necessary resources and manpower to quickly, efficiently and meticulously clean even the moat soiled and tarnished driveways. 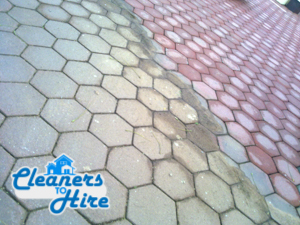 We from Cleaners to Hire are fully certified and insured cleaning contractors and throughout the years have been hired to sanitise the driveways of both commercial and residential properties. To us it doesn’t matter whether you have a single car parking lot and a large car park as we can swiftly and immaculately carry you large scale cleaning projects without costly delays and unwanted complications and this applies in all bookings in London. We have the needed expertise and technical capacity to perfectly sanitise all these surfaces and seal them with a protective layer if the material allows us. Some property owners have grass driveways in order to give a more natural look to their household or place of work. If that is your case, you should know that we can help you with the maintenance of this highly demanding property feature. We work with some of the best gardeners and we promise you that once your cleaners are done with your driveway cleaning project, we will send them your way so that they can take care of the grass and restored its damages areas. Cleaner to Hire is a company which is renowned for its eco-friendly services, so you can rest assured that we will use only green cleaning solutions which don’t contain any toxic or chemical elements. We work with eco-friendly products because they are highly efficient and more important because they cannot harm the materials from which your driveway is made. We work with a flexible schedule which eases the booking of our services. You can hire us via telephone, e-mail or the online form which we have posted on our website. Know that our customer consultants are at your disposal and will gladly lend you a hand with the booking process. Don’t be shy to contact us on a short notice because unlike other sanitation companies we have the ability to accept last minute bookings from anywhere in London. Aside of providing affordable driveway cleaning services we also offer a large selection of sanitation options to our clients. Keep in mind that if you use several of our services simultaneously you will be able to benefit from our special discounts and lower furthermore your property sanitation costs.